Case in point. 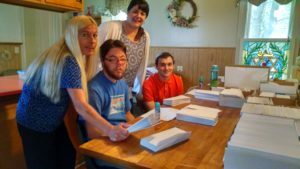 Adam Panebianco and Andy Gillespie, who are in the Community Prevocational Services program recently helped Interfaith Caregivers in Allegany complete a mailing to raise funds on behalf of Adopt -A-Ride. Interfaith Caregivers, funded through the United Way, helps frail elderly and others with severe limitations maintain their independence and dignity by providing transportation to medical appointments and other services. “I heard about the prevoc program and thought it would be a great opportunity for us to be helped by providing an opportunity of learning for prevoc participants,” Megan said. While Interfaith Caregivers supports many, there were few hands to do the work. Its need for help with a large mailing provided an invaluable opportunity for Andy and Adam to step in while gaining important work experience. Both are high school graduates. Andy started in the prevocational program in February of 2015 and Adam began in July of 2015. Through volunteering three days a week at non-profit agencies such as Interfaith Caregivers they are learning important employment behavioral skills, which are key to a successful work experience. They are also building a profile of work experience for eventual job placement in the wider business community. “We’ve met so many amazing and welcoming people and places,” Adam said, adding they had just completed volunteering at Washington West High School, Olean, where they color-coded and labeled books. Through the coaching and guidance of Theresa Abdo, their prevocational trainer, they process the experience. She also helps them identify what they especially like at the job as they consider their future in the job market. Participants in Community Prevocational Services have also volunteered at the Olean General Hospital, Loaves and Fishes Food Bank, Saving Grace Outreach Community Action and St. Mary’s Church among other non-profit agencies. Finding and developing a working relationship with these community-based non-profit agencies is the work of Deborah Poydock-Whipple, Community Site Developer, who is also an experienced job coach. After completing the Community Prevocational Services program, participants may be eligible for Pathways, a stepped up internship program which prepares people for job placement in the community. Community Prevocational Services was among programs and supports the Agency developed in response to recent government mandates calling for transitioning people out of work centers that exclusively employed people with disabilities and into the larger community.